The priest’s meeting room is in a building, maybe his domicile, across the street from a large orange church constructed according to what I want to call futurist prin­ciples and designed, I guess, to resemble the prow of a great ark. As we wait to be let in, the priest fumbling on the other side of a characteristically temperamental dead bolt of local make, in its tolerances so unlike the Yale lock, I think of Father Mapple’s noble sermon, his chapel which looks like a ship’s cabin, and of Ishmael kneeling to Queequeg’s black idol, Yojo, a figure I sometimes refer to, to the amusement of my students, as #Yolo. I wonder if they know the joke is scripted. The air of resignation to appear cheerful is not the same thing as a cheerful air, but is the air with which the priest inaugurates his twenty minutes of small talk. Gradually I recall that this priest is the same who, together with some kind of assistant—not the sora or sister-­cohabitant of the village priests, but a stocky young man dressed for business—was summoned to the apartment one win­ter we were in Roman, for what I understood to be a sort of annual house-­blessing; I was struck then as now by the same dutiful dispensation of small talk, as we, the priest, and the unacknowledged man I think of privately as the priest’s “muscle,” maybe “factotum” is better, exchanged tight­-lipped smiles in the living room. Come in, be seated, twenty minutes of small talk, presentation of goods, dis­creet exchange for cash, leave­-taking, just like a friendly drug deal, down to the folded banknotes pressed as if neither party were seeing it happen into the priest’s palm. Though no money changes hands on the present occa­sion, in character and duration the small talk is the same. I comprehend about half of it, which means following it thematically, but being mostly in the dark as to what claims or propositions are made, or whether their rela­tionship to content is affirmative or negative. I understand that the priest is making a paternalistic comment about Paula’s changed appearance, she replies yes, that she’s gained fifteen kilos, then the priest pauses expectantly. “Pursing his plump lips,” the prose says. After a moment, smoothing his trousers in a gesture of complacent self­-appraisal, the priest announces that his appearance, too, has changed. For he has lost eleven kilos, and hopes to continue losing kilos until the tally reaches a word I recognize as numerical but which I can’t men­tally retain long enough to sort. The word has existed like a friend’s face seen on the street, without realizing one has seen it, so that a few moments later, when with seemingly random intentness you peer at a stranger’s face, the friend comes to mind, in fact you mistake the stranger for the friend. That I should hear a word clearly but lose track of its sound before it can be formalized is a possibility which, to my further distraction, I consider now for the first time. It is often the case that when I mistake a stranger for some friend, however long it’s been, the friend materializes. Synchronicity or the Baader-­Meinhof phenomenon or whatever it is, the more general effect in question, maybe it’s the fact that the number of words or concepts to which we are exposed in a given moment exceeds, by orders of magnitude, those we can put to use. But the stream of un­noticed meanings rushing by must leave its impression, carving a channel for insights of the form “incredible, but I learned this word only yesterday.” Yesterday’s encounter does not sensibly exist, but is pulled up into the status of conscious experience only by the shock of today’s recogni­tion, so that encountering the word today, and encounter­ing it yesterday, are in some meaningful way simultaneous. It is with the same simultaneity that I generally experience dreams, not as a duration in sleep, certainly not as a chain of events, but rather, at the moment of waking, as an instantaneous precipitation or concatenation of images, memories in the sense that all representations are memo­ries, residues salvaged from the flood of time and, by juxtaposition alone, endowed with narrative coherence and meaning. The dream comes into being at once, outside of time, as a constellation of previously unlinked events, eventualities. Only on waking—though since it is made from memories, it is experienced as one—do I perceive the dream narrative: that I have been in such a place, that Paula was there, and Zhutchka, my dog who died. Cyrus Console’s books of poetry include Brief Under Water (Burning Deck, 2008) and The Odicy (Omnidawn, 2011). He lives in Kansas City. 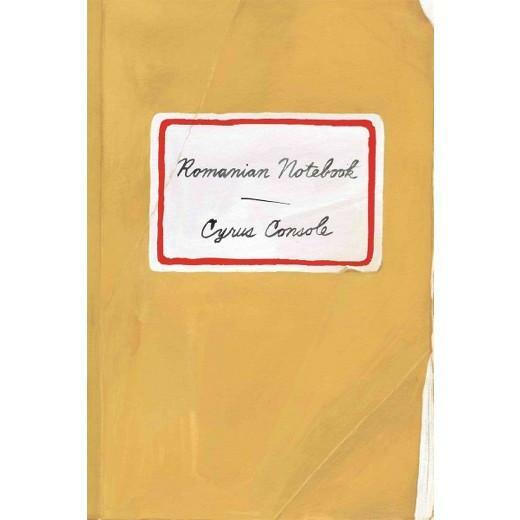 CLICK HERE to purchase Romanian Notebook. For more context, read this review by Michael W. Clune. *Excerpted from ROMANIAN NOTEBOOK by Cyrus Console. Published by Farrar, Straus and Giroux. Copyright © 2017 by Cyrus Console. All rights reserved.